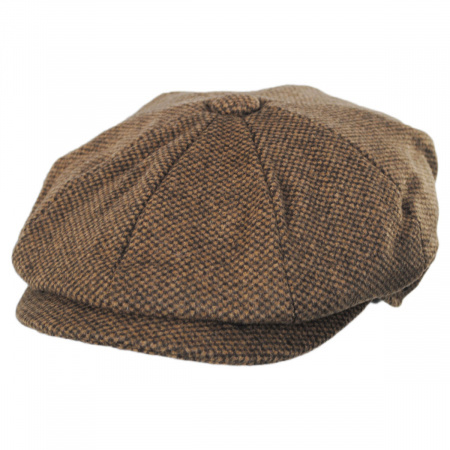 Currently the hottest style in the hat world - the newsboy style shines in the Gotham Newsboy Cap from Jaxon. 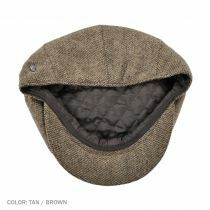 Made from a tan and brown pattern reminiscent of early 20th century newsboy caps while featuring a warm, quilted lining, the Jaxon Gotham Newsboy Cap is a stunning addition to the Jaxon Hats line of flat caps. The hat is nicely made and fits well. At first it seemed a bit snug, but it gives way well to a comfortable fit. I liked the product so well I bought a second one.....great selection for any style and taste, promptly shipped, right to your door!!! Lots of help and info on site. 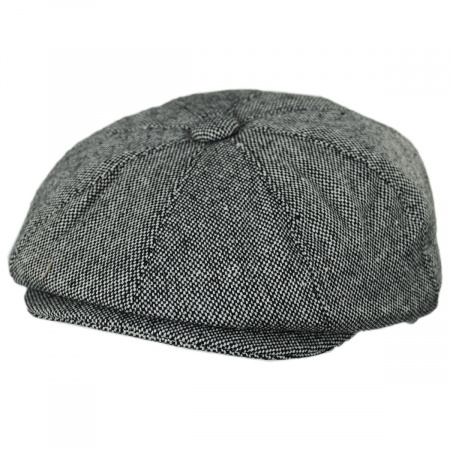 Having purchased the Gotham W/B newsboy cap, I find that it is quality product. Has good fit, and is sure to keep head warm since its wool and has pleated lining. One of my go to caps now. I purchased this cap for my father-in-law. It's very difficult to find a size that fits him and Village Hat Shop had the best range of larger sizes and styles. He loves the hat and I'm very pleased with the quality and price. I really like the hat in spite of the fact that it wasn't entirely what I was hoping for. I ordered a newsboy hat thinking it would be more floppy than it is. It fits perfectly as per your instructions on sizing and I like the color. Great hat with a great price! Well made, looks as good as on line. Size could be a bit slugger. Overall very happy. Great Hat! Nice weight and great material. I get lots of compliments. Also my delivery to Canada was swift! I ordered this cap because it looked quite a bit like one that my dad wore as young fella some 85 years ago. I was very pleased with the look and the fit of the cap. It is very light in weight, and I think that it looks pretty darned good. Would I order another one? You betcha! Each hat is better than the last! This was my third hat purchased from Village Hat Shop. And with each one I've thought this is THE hat for me. Then the next hat arrives and I think, no, this is the one! I guess I'll just have to admit I like hats. Thank the Cosmic Muffin for Village Hats. I have bought seven (7) hats from here and all hats so far fit great, they look good with everything I wear and I ordered two more, can't wait til they get in!! This is my go to hat place. Bought this cap for my 27 year old grandson. He absolutely loved it! Looks great on him. Will order more hats from you in the future. Can't have enough. The sizing chart is accurate. The hat is extremely high quality, the lay of the hat looks exactly like the ones on the series Peaky Blinders. Love it to say the least. Timeless classic. Very generous price point as well! Thanks Village Hat Shop!! First hat I got was a different color than I expected. Return was easy and I received this hat in exchange. Very pleased with the material and the fit. Light weight suitable for summer wear. Hat would be more attractive if it wasn't raised in the back. If it sat flatter and therefore would "sag" on one side it would be more interesting to look at and more attractive. I would buy 2 if it appeared as such. It would give it a more relaxed look. I'm very happy with the quality of this cap, especially for the price! Fits great, feels great, looks great, what else could you ask for! Thank you. The hat fit perfectly and is exactly what I was looking for. I don't like to purchase clothing online because I like to see how it looks. The hat looked great and the quality was outstanding. Excellent hat! Stylish and captures "part of the past"....warm and perfect color to coordinate with my Lands End green "squall" jacket...all set for winter!! 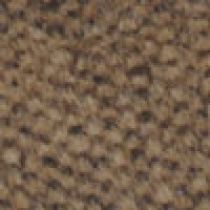 Soft, but durable material is warm, but not too warm. The fit is absolutely perfect! The Jaxon Newsboy Cap With a Blend of 50% Wool 50% Polyester outer shell and with a Quilted inner lining is perfect for cool weather guessing down to 30's. the only take away is it is made in China! Speedy service,great quality with true fit and a great price! Purchased a Gotham Wool Blend Newsboy Cap. Excellent Quality! Ordered Online and was a bit large. Returned it and requested Exchange for smaller size. All went smooth and new hat came in short order after returning the first one. Excellent Customer Service!! Will do business the this company again!!! Better than advertised and way better than other newsboy style hats I have purchased in the past. The fit is the best I have ever had, The build quality and attention to detail is very high. Better than hat 3X the price. As always, great service. The hat fit perfectly and is well made. Looks better than I could have hoped. Jaxon Hats makes great hats. I'm not surprised by the quality. However, I was pleasantly surprised by the size. I wear a size 8 hat (course this big Irish head of mine) and VHS lists the XXL hat as a 7 1/2 - 7 3/4. I figured I could buy it and stretch it a little until it fit, but I put it on and it fits my head perfectly. I don't know if the smaller sizes run just slightly bigger than advertised too, but it's worth noting that the XXL does. I bought this cap for my husband because it is much like the one Roy Underhill wears on the PBS show "The Woodwright's Shop." My husband is a budding woodworker who enjoys using antique tools, so this classic cap was just the ticket. He absolutely loves it, and it looks terrific on him. I was very pleased with the quality and price, too. All in all, an excellent purchase! Slightly more brown than tan; but with that said, a great cap. So far, nothing but compliments. Only complaint is that the visor leaves little indentations in the forehead. Other than that, true to size and looks great. I require a very small hat, so sizing can be iffy when buying through some sellers. This is the second hat I've purchased through Village Hat Shop, but it's the first Newsboy style I've purchased through them. Their sizing chart is very helpful and accurate. I love this cap. Aside from the great fit, it's nicely lined inside and keeps me warm. It's also a great looking cap that I'd recommend to anybody who likes this style cap. Hat is very well made. Color and size was exactly as website showed. Hat is lined and good for the colder weather. Service, as always, was top notch. I'm "Golden Rule, the Honest Umpire" for the Saginaw Old Golds vintage base ball (two words way back when) club. Yesterday we lost to the Lah-De-Dahs of Henry Ford's Greenfield Village, 11-8. The newsboy cap fit well and was so very appropriate for my 1880s outfit. And it got many compliments, too. Got it in one day. Its very English-Irish. Love the color. Looks good on anybody. Several have tried it on. Got lots of good comments by family and friends. We need more clothes hats and caps like this in USA. I don't usually mess with reviews but these folks did a real bang up job of supplying the product and getting it to me very quickly. Received it in only three days from California to Arkansas. The quality of the product is excellent and the service was excellent. I'm enjoying my hat and would recommend Village hatshop to friends. I've been looking for this cap for a long time. I found VHS on line and it has been the best and easiest on line purchase I've ever had. I love my cap. VHS will be my future exclusive supplier of headgear! Great hat. Great price. Great service. I live in Eastern Canada. This is a winter hat fit for the most extreme weather conditions. The fit was great ... it exceeded my expectations. I ordered a hat for my father-in-law for Christmas. He loved it. I was happy to see the good quality and the hat on his head for the rest of the day. The fabric, size and workmanship were very good. We were pleased with the hat and price. The hat is good, but the customer service from Village Hat Shop was great! We got this hat for a 1920's party. When my hubby got it he tried it on, he has now traded his baseball cap for this hat. He says it so light and comfortable. He got a size large and it fit perfectly! This cap fits and looks great! Two thumbs up for this cap. I am extremely pleased with my Jaxon Hats. I wil be getting all of my hats from Village Hat Shop from now on. I just received my Gotham Newsboy Cap. It looks great fits right ,like the look and feel of the material and the authentic vintage look. Very pleased. great looking hat. looks good wearing simple white t-shirt and some brown shorts. I am very pleased with this hat. It is well made and fits great. I look forward to many years of wearing this hat. Thanks Village Hat Shop for a terrific hat at a good price. Ordered this hat for a theatrical production set in 1910. Newsboys cap looks great! This is my first newsboy cap. I had been looking at newsboys for awhile. Quality and materials are excellent. Fits great and looks good. This Gotham Newsboy Cap is the first quality cap I've purchased in a long time! Fits great, looks great... is everything I wanted in a classic cap. Been wanting a newsboy style cap for some time...and Village Hat Shop had a ton of them to choose from. This one is perfect and at an unbelievable price! Just wore it for the first time to a gig my band played in and it looked great! 1930's period look. Truly. It's very well made. Nicely lined. The color in the photo is spot on with the hat you receive. For me, I wanted something with noticeable flop but not completely bohemian or overstated. I like to pull the flop toward one side. Easily done here. This hat provides the perfect balance between fit and form as well as the style of the period. I ordered this hat about 6 months ago in Large (the size I always order), and I loved it. The thing is it was so tight I had to wedge it down on my head. I figured it would stretch a little, so I went on a day trip to Mass., and that hat dug two holes in my forhead. When I first took it off my head had big red marks, so I had to wear it until I got back to the car to go home. It literally wore two holes in my head. So, with a tear in my eye I gave it to a friend and was seriously pissed everytime he wore it. Damn that hat looks good. So this time I ordered it in an XL, and wouldn't you know it, the damn thing slides all over my head, everytime a slight breeze kicks up I have to grab it to keep it from taking off, and everytime I bend over it wants to leave me. To give you a brief recap, your sizes for this hat are screwed up. This fit is exactly like the Union newsboy cap, which I also own, and looks like a newsboy cap should, not too floppy, not too flat, but a really nice overall look. Pretty substantial, too, and has kept my head warm in the icy winter months. Wish there was a larger selection of colors, but the brown is a nice shade. My husband had been wanting a newsboy cap, and I found this great hat for a very affordable price. I surprised him with it and he loves it! He wears it all the time and gets stares and compliments everywhere we go. I would definitely recommend it to anyone! I love this cap. It looks good and fits great!!! I am looking forward to building my cap collection with this site. Keep up the good work! Great full body look cap that is made with quality in mind. 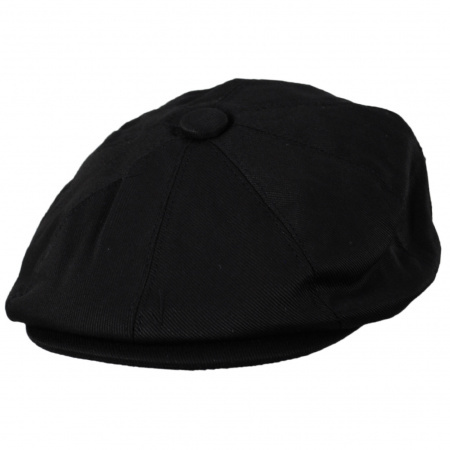 The wool blend cap has a nice liner inside which helps give the cap a full body look. Never seen a cap like this in stores for this price, plus free shipping. This hat fits just as expected. I wear a 7 1/4 in New Era 59Fifty hats, and ordered a medium. It fits perfectly. The style is perfect: not too big and floppy, but not super low profile like a lot of duckbill flat caps. The color on the photo is pretty dead on too. $25 is a great price. Not cheap enough to be crappy quality, but not ridiculously expensive either—there are plenty of far more expensive options out there. If you're waffling about this one, I say pull the trigger. Highly recommended. I have a lot of hats that I paid a lot more for than this one, but none is any better quality--Outstanding hat value. Village Hat Shop was very quick to ship and what I expected to take about a week for delivery came in 3 days! Won't be my last order from them! Everything about buying this hat was perfect. Good quality and fast delivery. Well done. Always wanted one of these. Really couldn't find one when in Ireland. Saw this company and bought it. Love it!! Cap came quickly. Size was perfect. Great color and material. It makes you feel like you are at a British sporting event .... don't ask me why. It makes you feel intelligent as well. You need to upgrade to this cap if you dare. 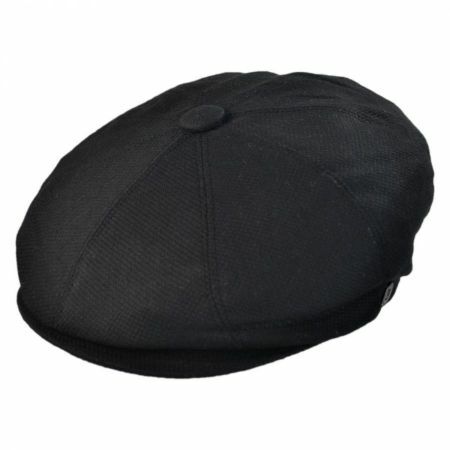 I have always wanted a newsboy hat and found a good selection on this website. The value was as expected, with no disappointments. The hat is lined and fits fine. Fits as expected. Great quality. Super service! Great value......fits perfectly & looks great! Great hat for the price! Hat looks and fits great. Rare to find an XXL this nice! Love the hat. Fit was spot on, and it is well made. Color was true to the pictures. Very pleased. Nice comfortable hat. Not tight, which I like for my big head! I was initially afraid that a hat this inexpensive would not be warm enough, but I find it quite comfortable in all temperatures. It fits just great, and I get a lot of compliments on it. I also loved that it shipped the same day, and I got a coupon with my receipt. I don't buy hats anywhere else! Good Quality and Very fast shipping! The picture of this hat accurately represents what you get. It is very well made and the color is perfect! I find it hard to find a hat that fits correctly on my head, but this hat was absolutely perfect! You won't go wrong with this, and the staff at Village Hat Shop got this in the mail within a few hours of ordering. I will order from them again!. The quality and fit exceeded my expectations, very nice looking hat. My new favorite. Very nice. Fabric is nice and soft. Hat takes on personal shape and breaks in easily. Great quality, great price and super fast shipping. What else could you want? I love the Newsboy style, but can rarely find in my size, XL. The hat was as advertised. Good quality and fit. Good service. I will be back. Great hat Great Value Fast Shipping! Quality at a great price! Must have been same day shipping! the hat is perfect, thanks to your sizing chart. I was a bit worried because I have a difficult time finding just the right size (in between medium and large). The hat is awesome, I have gotten lots of compliments on it. Great Quality and Great Fit!! Hat is well made and fits perfectly. This is the classic ""newsboy"" cap I have been looking for. Great fit, nice style, priced just right. I wish Jaxon made this Gotham Newsboy Cap in other colors - black/charcoal, olive green, etc, I would buy more. Cheers! Bought the hat for my son and he liked it. It fit nicely and looks good on him. It is a nice quality hat. Great value and good looks. I'm very happy with the product. Jaxon Hats is my first choice for casual headgear. I had owned a hat like this years ago and lost it. i have never been able to find another one at any store.I decided to look on the net. This was by for the best site. And the prices are wonderful. I am so happy with my new hat. I bought this hat after my husband lost the one he had for years from the 70s! This was the closest I could find that looked like the one he lost. He loves it! It fits perfect and looks great on. Thank you Jaxon Hats! I love the hat, purchased it because I had a similar cap (New Boy) years ago that had a over sized top. Nice cap, good quality. The first one I order was to large and I had to return it. The second one was much better (as far a size). The only issue I had was the USPS lost the second hat (after 5 days past the expected delivery of priority mail) I notified Village Hats, they sent a replacement via FedEx, I was very impressed. Looking at other hats they offer now... great store. Decided to buy a new hat on-line . I first though it was a little snug but , found it to be just right after a couple of times of wearing it . Really like this hat ! This is a nice cap, very well made. My husband loved the color, fit and styling. Will be purchasing more! I like this cap because of it's proportions. 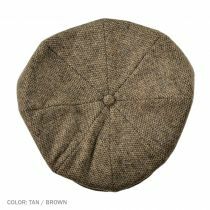 Unlike most Newsboy caps that spill over the sides this cap has proportions almost like the Ivy cap. The tan/brown tweed is beautifully subtle giving the cap a very hip elegance to it. Nice hat, fits good like it should, fair price and quick turn around. 5 Stars! (Gotham News Boy) Will buy from Village Hats again! This hat fits great and looks great. My best hat purchase in a long time. The hat fits real good and looks real good! It is just what I expected. Thank You Village Hat Shop!!! I received my cap today,Thanks to everyone that answered my question.I was glad i ordered it its well made and looks good. I am very pleased with my purchase. It is quality, it fits comfortably, and it holds its shape. I doubt I could have made a better choice. This is my favorite. I purchased two other hats but so far I have worn this one the most. Great quality and great price. Exactly as advertised. Fits perfectly. Shipping time (to Maine) far exceeded expectations. I will definitely be a repeat customer. I've been looking for a good newsboy for quite a while and finally found it here at Village Hat Shop. Great hat, well made and true to size. Village Hat Shop has a great selection, great prices and fast shipping. Couldn't be happier! I have worn this hat for a while and love it. My late wife's twin sisters tell me it looks like the hat their ""Daddy"" wore many years ago but, that really doesn't explain how it feels on, or the quality it has. It fits like most other Jaxon hats I have worn but the quality in this hat is much better; as good as another brand costing three times more. It's a fine addition to any Newsboy hat collection which I'm sure you'll appreciate, as I do the color. However, there's another kid on the block and I feel they will both compliment each other. I will be reviewing the other shortly. Good quality, great price, very comfortable, good all around value. I do wish they would offer free return shipping having purchased the wrong size to begin with. I've been wearing baseball caps my whole life, but after looking at the Village HatShop selections of newsboy and ivy caps, I've converted. My wife thinks they look great on me and my friends have noticed as well. 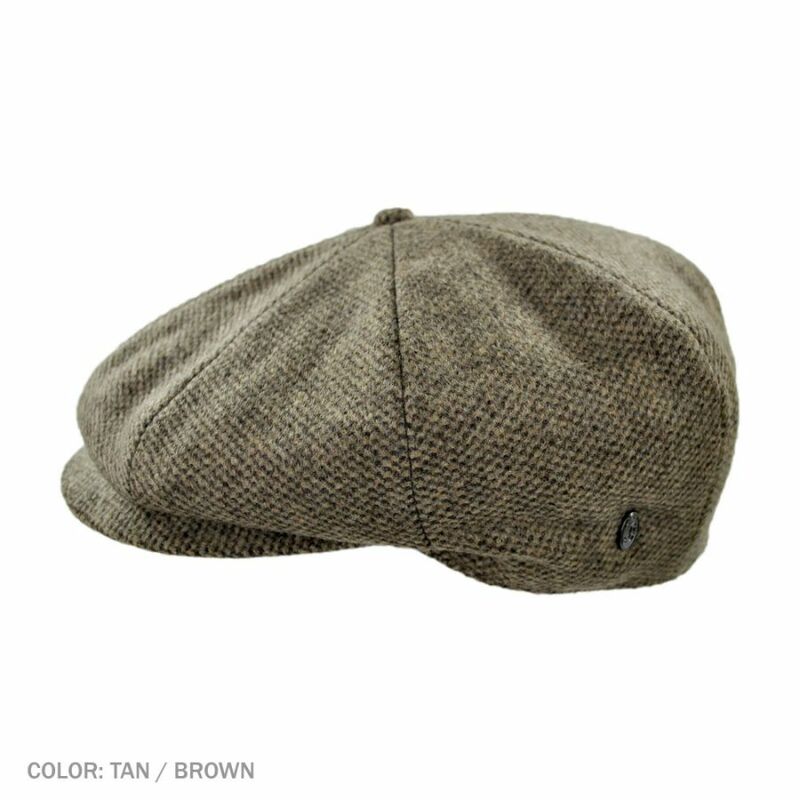 I ordered four hats from Village, and this Gotham Newsboy tan cap is my favorite. It has a very classy, and timeless look. I saw a replay of the movie, ""The Greatest Game Ever Played"", and also saw ""The Artist"" the recently. When I see those caps on screen, it brings a smile to my face. Very good hat purchase. Looks good, very good quality for price, love the color, although slightly darker than photo, it was perfect.